Real-time systems used for object tracking in robotics, drones and ground-truth reference. 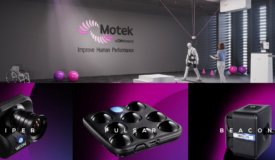 3D Motion Capture has been our expertise and our passion for more than 20 years, and we’re still excited about the use of this technology in both new and existing applications. We work closely with our users to obtain a deep understanding of their requirements – we are then able to use our experience and know-how from similar applications to suggest the best solutions, consisting of hardware, software and training. Our goal is that the technology should contribute to increased efficiency and new possibilities. We hope that you’re interested in what we offer, and we look forward to hearing from you! The Laboratory for Movement Biomechanics focusses on the study of whole-body and joint kinetics and kinematics during both daily and sport activities. Through targeted application of key experimental and computational techniques, we aim to understand the control and quality of movement but also musculoskeletal conditions in healthy and pathological subjects. Among others, the interdisciplinary group of researchers is known to answer complex questions based on precise measurements and for sophisticated evaluations and modeling. Their unique, movable fluoroscope allows to capture the 3D kinematics of the joints during movement. The laboratory for Movement Biomechanics at ETH Zurich supports the development of medical and biomechanical technologies and evaluates their accuracy.